The indoor, Bokashi system ferments waste in less than half the time of conventional composting methods. Recycle waste into something wonderful! This unique, odorless indoor composting system ferments and pickles food waste in less than half the time of conventional composting methods using the Japanese method of Bokashi. Convenient - Stores neatly under kitchen sink for easy access, every few weeks contents can then be buried in your garden. Large Capacity - Holds approximately 5 gallons of food waste. Air-Tight Lid - Ensures an ideal environment for anaerobic fermentation to take place, while controlling odors and deterring flies. Plastic Strainer & Spigot - Placing the plastic grate inside the bucket and then piling food waste on top of it separates the food waste from the liquid that accumulates at the bottom of the bucket. This liquid can be easily drained through the spigot and used as a nutrient-rich fertilizer for houseplants and garden. 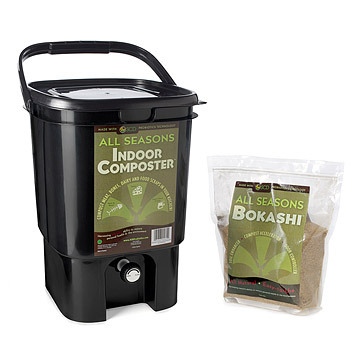 Bokashi - An all-natural compost starter containing beneficial micro-organisms that aids in fermentation. Once the bucket is full, it will take only 10 days to produce a pre-compost product ready to bury in the garden. After planting, the compost will be converted to rich topsoil in about one month. Compost inoculates the soils with beneficial and effective microorganisms which detoxify chemically treated soil, feeds the natural soil ecology, and attracts beneficial insects and nematodes. It also enhances soil fertility and increases plant yield and produce quality. Each composter comes with a one gallon bag (2.2 lbs.) of bokashi. Additional one gallon bokashi refills available. Due to the 10-day cycle needed for fermenting, two composters are recommended to have a complete, always-running system. Click here to read about the benefits of composting. Click here to read an article about speed composting from the Wall Street Journal. - Up to two-thirds of most household trash can be composted. - Making compost lightens your garbage and keeps it from smelling. - Composting reduces the need for more landfills. - Homemade compost is a free and chemical-free fertilizer for your garden. - Compost improves all soils - it opens up clay soils and hold moisture and nutrients in light and sandy soils, reducing the need to water and fertilize. - Compost helps make healthy soils and healthy soils lead to healthy plants and thus, healthier animals and people. Made in Thailand. Without bokashi, the product can also be used as an organic garbage pail (for fruit and vegetable waste). Wonderful item. Team bought one for our boss on National Boss' Day. Then personally bought another for my man. Both our boss and my man love this item. They were so happy to receive a completely practical and useful gift. Both are into Earth conservation, going Green, and recycling, so this was an excellent interactive gift. Both were a little bummed about having to layer the compost, but admitted they may not have known it was different than outdoors composting. Once each of them fully read the instructions, they understood and have been using it non-stop ever since. I have used an outdoor composter for many years, but this indoor composter is so easy and convenient to use that I'd recommend it to apartment dwellers or anyone for whom outdoor composting would be impractical. I want to plant an English flower garden in my backyard and would like to try nature's way first. I've tried composting outside but was never successful. I'm following the instructions to the letter and am hoping that it turns out as it should. The vegetables I am composting have not been in long enough to use, but I believe that it will be perfect when the time comes. We use the product to reduce our food waste to the trash. We like that it is small enough to fit under the sink and it is very easy to use. So far so good. I just started but so far I really love it. It was something I have wanted for some time so this fits thr bill. With the probiotic mix, kitchen food scraps are easy to place in the bin and there is no offensive odor from the decomposition process. I grew up composting and I am thrilled that I can now compost as an apartment dweller without having to pay for an expensive service. This is affordable, efficient, and helps me with my urban gardening. I have been very busy outside of the home, so I haven't really maximized the use of my composter. What I have done is working. It's very simple to use, good size. Great size for us and works unbelievably well.